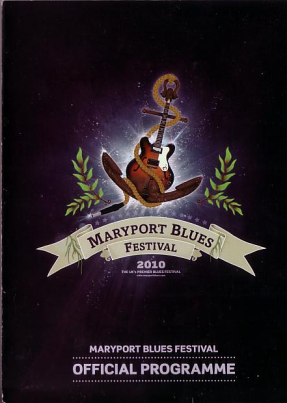 This was my fourth, and Marie’s second, visit to Maryport for the Blues festival. This year we decided to visit for the Saturday and the Sunday. We drove across on Saturday afternoon and checked in at the Ship, Allonby which is about 5 miles up the coast from Maryport. Allonby is a lovely town with wonderful views of the sea, and a great coastline and the Ship is a nice pub offering rooms for bed and breakfast. On the Saturday evening we ventured into Maryport centre for the blues trail. The place was packed and there were queues to get into all of the pubs, so we retreated to the rugby club where the main marquee for the festival is situated. The Saturday night was headlined by Mica Paris and Booker T. Booker T was excellent. He still uses his famous Hammond organ and Lesley cabinet, and he treated us to favourites such as Green Onions, Time is Tight and great renditions of Dock of the Bay, Ain’t no Sunshine and Hold On I’m Coming. It was a rare chance to see a true legend (his only UK date in the current European tour) and he didn’t disappoint. We were up early on Sunday morning and had a walk along the beach which blew away the cobwebs and got us ready for the day. We drove into Cockermouth and had a look around Wordsworth’s birthplace before going into the festival later in the day. We passed Paul Jones in the street in Cockermouth; he is in Maryport for the festival and is recording for a three hour special for his Radio 2 Blues show. Headliners were Canned Heat (yes they are still playing) and Robert Cray. It was Canned Heat who I had really come to see. The band consists of the original drummer who has been there throughout since the 60s and the recently returned to the fold Larrie Thompson on bass and Harvey Mandel on guitar. They are billed as the Woodstock lineup as those three guys all played at that famous festival. They open with On the Road Again which sets the pace for a host of blues and boogie tunes, including the other hits Going up the Country and Lets Stick Together. They still sound great; tight as anything, although for me some of the solos go on a little too long. We return to the Ship on Sunday night and drive home Monday morning. Another great blues festival. 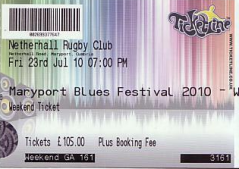 The attendance was pretty good (there were rumours that ticket sales were slow and that this may be the last festival due to funding problems); I certainly hope it returns next year and keeps its place as one of the premier blues festivals in the UK.